Out-of-home dining is a huge industry in the United States. From fast food to fine dining, millions of consumers frequent restaurants every day. Not only are Hispanics changing the demographic makeup of the country, but they are also making a remarkable impact on all aspects of quick-service business, from marketing and branding to product development, hiring, and more. “Hispanics are also a young demographic, comprising more than 23% of the population under 18 years of age,” says Liz Geraghty, Vice President of Brand Marketing for Wendy’s. “As a restaurant brand, you really have to engage and connect with this consumer to succeed and to stay relevant,” she explains. In the last three months, 85% of Hispanics and 81% of non-Hispanics reported going to a Fast Food restaurant, a percentage significantly higher than that of any other restaurant type. For both consumer segments, Fast Food is the most popular option for weekday breakfast, weekday lunch, and weekend breakfast/brunch. 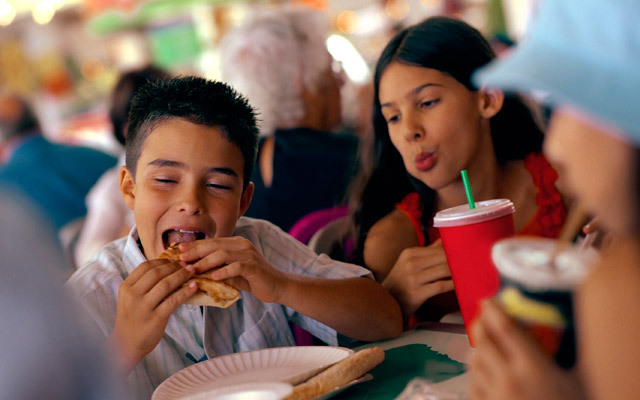 Hispanics are more likely to go to a Fast Food restaurant with family members, while non-Hispanics are more likely to eat at a Fast Food restaurant alone. Hispanic women are more likely to eat at Fast Food restaurants with family members compared to men. On the other hand, acculturated and Millennial Hispanics are more likely than their counterparts to eat alone at Fast Food restaurants. The average Hispanic consumer visits a limited-service restaurant 155 times each year, compared with the general population’s 151 visits. When asked to rank the five most important non-food factors which influence their restaurant choice (ambiance, parking, alcohol selection, etc. ), price was in the top five for both Hispanics and non-Hispanics (Hispanic: 63%, Non-Hispanic: 74%). Additionally, quality of service (Hispanic: 61%, Non-Hispanic: 64%) and friendly service (Hispanic: 49%, Non-Hispanic: 49%) emerged as the second and third most important factors for both consumer segments. Among those who eat at each restaurant type, Hispanics are significantly more likely than non-Hispanics to eat at fast food restaurants with dining companions (Hispanic: 58%, Non-Hispanic: 46%), fast casual (Hispanic: 70%, Non-Hispanic: 61%), and deli/diner/pizza parlor (Hispanic: 79%, Non-Hispanic: 67%). Family or significant others are the most popular dining companions for Hispanic consumers, across restaurant types. Hispanics reported being significantly less likely than non-Hispanics to choose delivery/takeout for pizza, Asian food, fast food, fast casual, non-Asian ethnic food, and casual-sit down local restaurants. Acculturated Hispanics are more likely than their counterparts to order-in at pizza, Asian, and fast food restaurant types. Most consumers opt to order takeout/delivery over the phone or in person, rather than through the restaurant’s or a third party’s website/app. However, there is one exception: more than a quarter of Hispanics (28%) and 40% of non-Hispanics reported ordering pizza through the pizza restaurant’s website. Restaurants which provide online ordering should offer the option of ordering in Spanish: 76% of Hispanics who ordered online said that they would probably (21%) or definitely (55%) order in Spanish if they had the option to do so. This is particularly true among bicultural (82%) and unacculturated (96%) respondents.